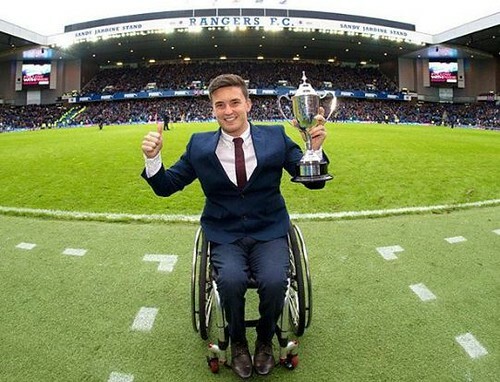 Gordon Reid, affectionately known as “Gio,” is the new darling of the wheelchair tennis world. Last weekend he made history winning the first ever men’s singles title held at Wimbledon, a lifelong dream achieved at only 24 years old. He also won the Australian Open this year. He is on fire. After Reid became paralyzed at age 13, wheelchair tennis was the therapeutic outlet Reid needed. Now its 11 years later and his therapy has become so much more – a life’s passion, and a ticket to stardom. Read on for the backstory of one of Scotland’s most exciting sports stars. While growing up in Alexandria, Scotland, Reid loved sports. Soccer was something he loved to watch (a lifelong Rangers FC fan). Tennis however was his passion. He started playing the age of 6. But his whole life changed when he was 13 years old and he began to lose feeling in his legs over a two-day period. When his legs gave way underneath him, he was rushed to the hospital where he was diagnosed with Transverse Myelitis. A disease that makes the spinal cord swell, it permanently paralyzed Reid from the thighs down. Amazingly, he turned to wheelchair tennis straightaway after returning home from the hospital. In April 2005, only six weeks after returning home, he won his first ever wheelchair tennis title – the B Division Singles at the Glasgow Wheelchair Tennis Tournament. “I didn’t even know wheelchair tennis existed before my injury,” he admits. Within a couple of years his skill-level skyrocketed. In 2007, he became Britain’s youngest National champion in wheelchair tennis at the age of 15 and at age 16, he was invited to be on the UK Paralympic Tennis team for the Beijing 2008 Summer Paralympics. He played again at the London Paralympics in 2012 where he reached the quarterfinals in singles. That was four years ago and Reid just keeps getting better. He’s played in the big three – French Open, U.S. Open and the Australian Open since 2013 (and won the French Open and U.S. Open last year). Huge wins for sure, but this year has proven to be the year of dreams coming true. In January 2016, Reid traveled to Australia for the Australian Open, a title that had eluded him since 2013 and this year he won, securing the first grand slam singles final of his tennis career. Next, he played the French Open where he was a runner up. But last weekend, on July 10th, 2016, history was made when Reid won the first ever Wimbledon singles match for men’s wheelchair tennis (only wheelchair doubles had been played at Wimbledon until this point), beating out Sweden’s Stefan Olson 6-1 6-4. He also won the wheelchair doubles competition this year at Wimbledon with his partner Alfie Hewitt. And the court was full, proving Reid’s belief that wheelchair tennis is becoming more respected in the able-bodied world. “I think there’s a mutual respect. I’ve seen the change from the first times I played in Grand Slams three or four years ago,” he told the BBC. Basking in the light he deserves, Reid truly is accomplishing what he set out to do. He’s always had two goals – to inspire kids with disabilities to play tennis and to show the able-bodied world that athletes with disabilities are to be reckoned with. Needless to say, we can’t wait to see what Reid accomplishes at the Rio Paralympics later this summer. Do you play wheelchair tennis? How did this sport help you recover? 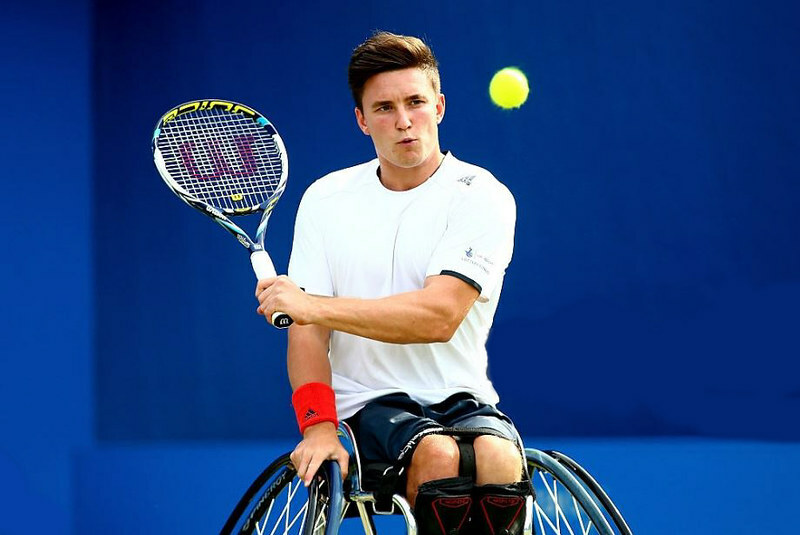 This entry was posted in SCI Superstars and tagged gordon reid, wheelchair tennis, wimbledon on July 15, 2016 by Tiffiny.